The Proust Questionnaire — a parlor game popularized by the French essayist and novelist, Marcel Proust — is said to reveal a person’s true nature through a series of probing (i.e., nosy) questions. 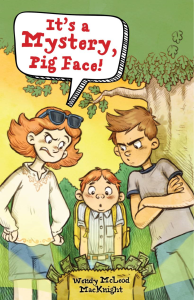 In the hot seat today: Wendy McLeod MacKnight, author of the forthcoming MG novel, IT’S A MYSTERY, PIG FACE (Sky Pony Press, February 7, 2017). What is your idea of perfect happiness? It’s Christmas Eve, the snow is falling, everyone is home, and I’m watching It’s a Wonderful Life. That or sitting under the apple tree at the Kingsbrae Garden Café in St. Andrews, New Brunswick, drinking a Sauvignon Blanc and looking at the ocean and the gardens. What is your greatest fear? That humans will never evolve enough to take care of their own. Which living person do you most admire? Jimmy Carter. What is your greatest extravagance? Books and shoes. What is your current state of mind? Hopeful. What do you consider the most overrated virtue? Moderation. On what occasion do you lie? When someone asks me how tall I am or how much I weigh. Besides writing, which talent would you most like to have? I wish I were a tap-dancing singer! What do you consider your greatest achievement? Besides my children? Leaving a successful career at age 50 to pursue my lifelong dream of writing children’s literature and actually getting published. If you were to die and come back as a person or a thing, what would it be? A peony shrub. You get to come back every summer, and you have a couple of great weeks in June when everyone’s looking at you and saying how great you look. What is your most treasured possession? Besides my sense of humour, my knobby knees, and my work ethic? My mother’s portrait. What do you regard as the lowest depth of misery? Enslavement or child abuse. What do you most value in your friends? Kindness, a wicked sense of humor, and cool dance moves. Who are your favorite writers? So many! Charles Dickens, Jane Austen, Virginia Woolf, Madeleine L’engle, Neil Gaiman, J.K. Rowling, Jeanne Birdsall, Kate di Camillo, L.M. Montgomery, Maud Hart Lovelace, Patricia Wrede, R.J. Palacio, Ann Patchett, Elizabeth Gilbert, Jennifer Longo, Cassie Beasley, Susanna Clarke, Philip Pullman, Thanhha Lai, William Joyce, David McCullough, Tana French, Michael Scott, Shirley Hughes, Virginia Lee Burton. The Sweet 16s, The Swanky 17s. Who is your hero of fiction? Female: Anne Shirley, Anne of Green Gables; Male: Sydney Carton, A Tale of Two Cities. Which historical figure do you most identify with? Anne Boleyn. It’s not easy being a woman in a man’s world. 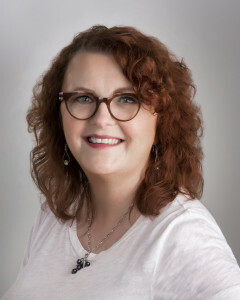 WENDY MCLEOD MACKNIGHT grew up in St. Stephen, New Brunswick, with a library card as her prized possession. Her first career was serving the people of New Brunswick through its public service, where she was head of the Department of Education. Wendy lives in New Brunswick, Canada, with her family and a ne’er-do-well groundhog named Brownie. Find her on her website, Facebook, Twitter, Instagram and Goodreads.